Whether you're a teenager interested in joining NYO or a parent / guardian keen to know more about what we do, we hope you'll find your questions answered below. General FAQs related to being in NYO can be found here. If you don't find what you're looking for here or elsewhere on our website, please feel free to email us auditions@nyo.org.uk. How much does it cost to audition? There are no auditioning fees, and we can help with travel costs to and from the audition venue. For further information please email info@nyo.org.uk. How should I prepare for my audition? First of all you should read through the downloadable information found here on our website. There are lots of other resources on our website too, such as videos from previous applicants as well as our tutors, which you can find here. We can’t say enough how important the excerpts are. 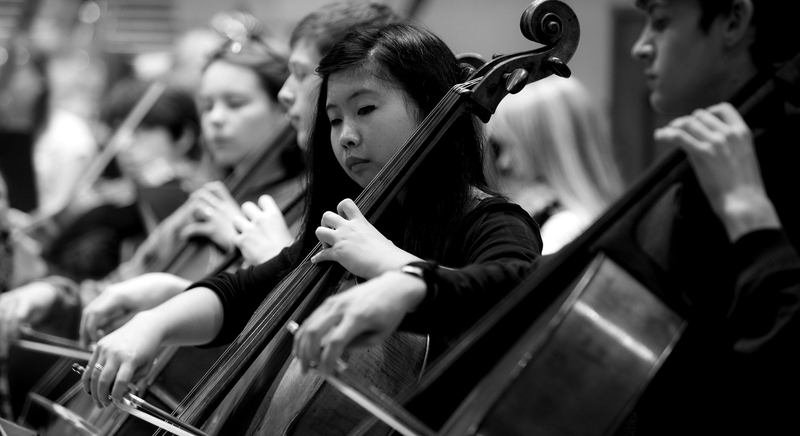 This is a chance for you to demonstrate skills and passion in an orchestral context, and for us to see how you might go about preparing orchestral music in advance of NYO Residencies. How do you select people for NYO? NYO and NYO Inspire include a vast amount of musical activity. What we look for across the board are musicians who are passionate about music, and who can demonstrate potential and talent. We have four criteria we look at during auditions: technique, musicianship, orchestra/ensemble skills, and attitude and approach. To maintain our standard as a world-class orchestra, we require not just a high level of musical skills, but also a collective working ethic, a desire to contribute to the NYO community, and a passion for sharing music with others. We also have to balance each section; this selection varies from one year to the next, dependant on who else applies and the competition that brings. You need to be of a standard equivalent to that required to pass Grade 8 distinction but there is no need for you to have taken any exams. If you don’t have an exam mark sheet to upload to your application, please ask your music or instrument teacher to provide written confirmation that you are of the required standard. I'm nervous about the auditions. What do they involve? Nerves are entirely natural, which is why we ensure that our auditions are very friendly. All instruments except double bass, harp, percussion and tuba have two rounds of auditions. In a first audition, we ask you to play orchestral excerpts and accompanied pieces to an NYO Tutor from your instrument family, and take part in a short workshop with a small group of other candidates, which is focussed on general technique and ensemble skills. There’s also a short discussion, so you can tell us more about yourself and ask any questions. In second auditions (and single rounds), you will play to an NYO Tutor for your instrument and a member of the NYO team, and share a sectional workshop with other candidates. No, we ask everyone to play with an NYO accompanist. All NYO accompanists are hugely experienced accompanists and are used to playing with young musicians too. Can I play unaccompanied pieces at my audition? day, or you can bring your own accompanist if you prefer for first round auditions. To find out more about what the application process is, please see our downloadable information. Can I change my audition date if it is inconvenient? We aim to give everyone a first-round audition at their first choice location. If the date is unsuitable, we do our best to offer an alternative at your second choice location. There is a space in the application form for you to tell us which dates in September might be difficult for you. We have very limited flexibility for final round auditions, so you should make sure you are available for your instrument’s final round dates. You can find these here. Where can I find the audition excerpts? Excerpts are available from 16 April 2019 on the excerpts page of our website. All excerpts need a password before you can access them, so that we keep within publishing guidelines. The password is included as part of the application text so you can see the excerpts while you are completing your application. You can also email auditions@nyo.org.uk to receive this password at any time. Make sure you prepare your instrumental excerpts thoroughly. It is an important part of your audition in demonstrating your orchestral skills. Have a listen to the repertoire and take note of the tempos and musical style. It's a good idea to take these excerpts to your teacher, just as you would your chosen pieces. What characteristics does my son / daughter need? First and foremost applicants should have a passion for classical music but they will also need to be committed, dedicated and hard-working. The reward for this hard-work is life-changing musical experiences and the opportunity to share their musical passion with other like-minded young people. What is the time commitment to NYO and NYO Inspire? NYO musicians need to be available for the three residencies each year (in December/January, April, and July/August). Each Musician will also be allocated to some projects (around 5-10 days) as part of NYO Inspire across the year. Before selecting you for a project, we will give you the opportunity to tell us about any dates that will be an issue for you. You can find the complete dates for NYO 2020 here. Will they need to take time off school? Most of our projects take place in school holidays but there may be some requirement to take a small number of days off school. This could be because the school holiday in your area is different to the rest of the country or because a project takes place outside the holiday period. We can help with contacting your school, writing letters if needed and discussing dates in advance. We recommend you contact you school with the dates as soon as your musician is offered a position in NYO so that when you send us your availability this is considered. Can I attend the audition? It is usual for parents and guardians to bring their son/daughter to the audition but you are not permitted to attend the warm up, audition or workshop. The young musician will be invited to warm-up on their own and then have a short session with the NYO accompanist. After this they will be taken directly to the audition by the NYO Steward (and NYO Support Team member). Parents and guardians will not have contact with their young musicians from when they go for their warm-up until the end of the audition. We aim to make the audition a positive process which will be beneficial to all young players. They will receive written feedback after the audition.